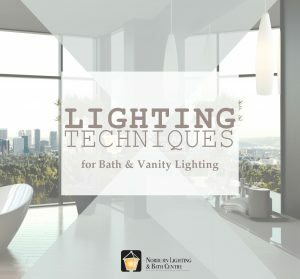 Posted February 3, 2017 by Norburn Lighting and Bath Centre & filed under LED, New Products . 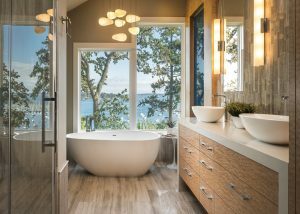 We are anticipating the arrival of some bold and innovative pieces from Cerno that infuses modern architecture with natural elements. 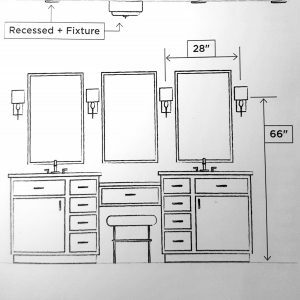 Here is what you can expect to see in our showroom in the weeks ahead! At almost 8 feet tall, the Valeo arches over any surface to provide ambient lighting. 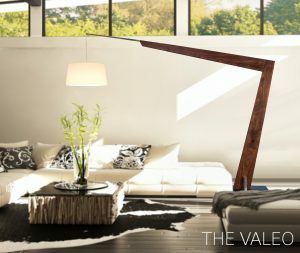 This floor lamp has an angular design made of walnut and aluminum that contrast the white fabric shade. The adjustable aluminum arm and shade make the Valeo unique. The shade can suspend as high as 6 feet 7 inches from the ground, and can hang as low as 3 feet 11 inches from the ground. 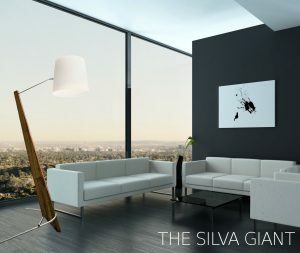 The Silva Giant is another grandiose floor lamp, standing 7 feet tall. The Silva Giant is functional and stylish, providing necessary lighting for reading and an additional layer of lighting for a room. The floor lamp is designed with a curved base in walnut and brushed aluminum hardware for stability on uneven surfaces. The cord of the lamp feeds through one of the aluminum feet, keeping a portion of the cord hidden and maintaining a streamline look. The Levo is crafted with functionality in mind without compromising aesthetics. 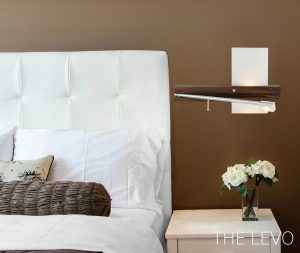 The bedside wall sconce offers ambient lighting and task lighting for the late night reader. The reading light swings out from the base, and automatically turns on when it is in use. When the reading light is tucked away, the light automatically turns off. The Levo also has a built-in USB charger that satisfies the techy in everyone. 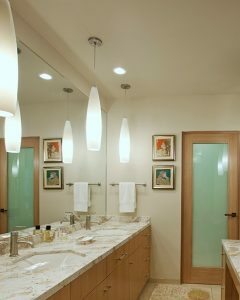 This wall sconce is available in both the left and right model to ensure that both sides are not left in the dark! 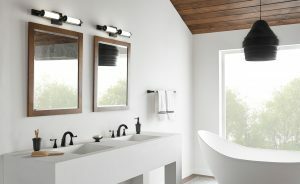 We are also excited to introduce three pendant fixtures from Cerno, including the Calx, Imber, and Ignis. 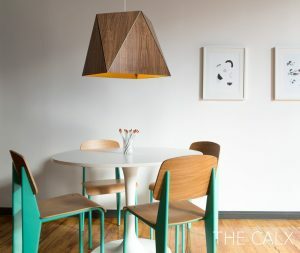 The Calx has a stunning geometric design made of walnut panels that create a prism appearance. 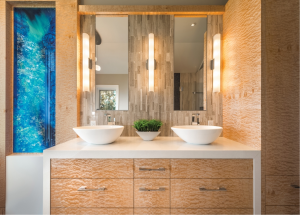 The inner shade is lined in brush brass for a pop of metallic, adding visual interest. The bold design and large scale of the Calx makes it a great statement piece for any room. 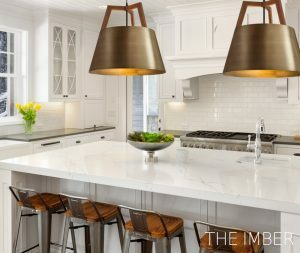 The Imber and Ignis are both designed with a brass finished bouillotte shade, and walnut arched arms. The Imber is finished in a distressed brass and is slightly taller at 17.75 inches, and narrower at 17 inches. The walnut arms on the Imber pendant is more dominant, protruding out slightly taller than the arches on the Ignis. 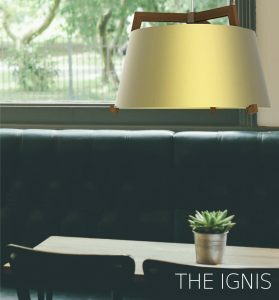 The Ignis is finished in a brushed brass and is shorter at 14.75 inches, and wider in diameter at 24 inches. The walnut arms of the Ignis also extends to the bottom to help support and help frame the shade. 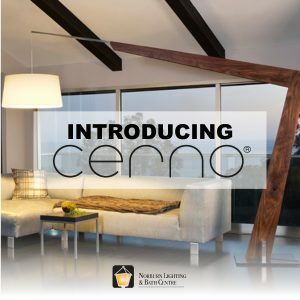 For more information on the Cerno products, contact our showroom. We can’t wait for their arrival!